Navalkol is Alkol or Knolkol or Gathgobi or Kohlrabi or German Turnip. You get it at a vendor who sells green vegetables. We generally make subji using Navalkol bulb but throw away the leaves. These leaves are very nutritious. So I decided to add these leaves also in a soup. 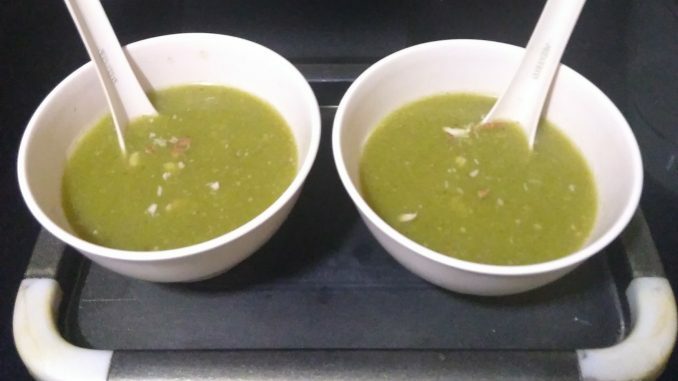 I created my own recipe for this soup. 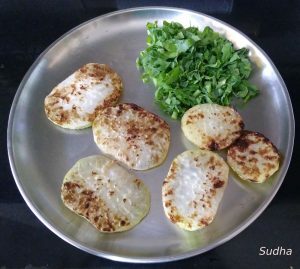 I roasted Navalkol slices with little Ghee to reduce its strong flavor. 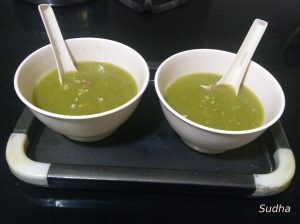 Soup turned out to be very thick and delicious without using corn flour. Try this out. Do not use Navalkol stem if is it not tender; Use only leaves. 1. Wash and Peel Navalkol Bulb and make thin slices about ¼ cm thick. Wash and chop Leaves (Greens) separately. 2. Heat a Griddle. Spread little Ghee (Clarified Butter) and arrange Navalkol slices on the Griddle. Roast on both sides on low flame till you see small brown spots on the slices. 3. Take them out on a plate and leave to cool. 4. Grind roasted slices along with leaves into a smooth paste. Add water if required. 5. Heat ghee in a deep pan on low flame. Add crushed garlic and sauté till light brown. 6. Add Navalkol paste into the pan. 7. Add black salt, black pepper powder and Mango Powder (or lemon juice). Add water to adjust consistency. Boil the mixture for 10 minutes. 8. Add roasted groundnut powder and mix well. 9. 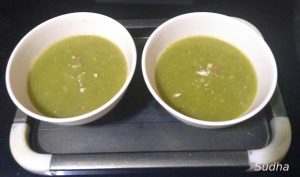 Healthy and Tasty soup is ready. Serve hot. ही माझी स्वतः ची रेसिपी आहे. हिवाळ्यात छान कोवळे नवलकोल / अल्कोल बाजारात मिळतात. आपण नवलकोल च्या कांद्यांची भाजी करतो आणि पानं टाकून देतो. मी सुपामध्ये नवलकोलाच्या कांद्याबरोबर ही पानंही घालते. नवलकोलची उग्र चव कमी होण्यासाठी मी नवलकोल भाजून घेतला. खूप टेस्टी आणि पौष्टीक सूप बनतं. तुम्हाला नक्की आवडेल. नवलकोल चे दांडे जून असतील तर घेऊ नका. फक्त पानं घ्या . १. नवलकोल चा कांदा धुवून सोलून घ्या आणि त्याचे पाव सेमी जाडीचे काप करा. पानं धुवून चिरून घ्या. २. एक तवा गरम करून त्यावर थोडं तूप लावा. नवलकोल चे काप तव्यावर ठेवून मंद आचेवर दोन्ही बाजूनी तपकिरी ठिपके येईपर्यंत भाजून घ्या. ताटलीत काढून गार करा. ३. नवलकोल ची पानं पानं आणि भाजलेले काप मिक्सर मध्ये एकत्र बारीक वाटून घ्या. जरूर पडल्यास थोडे पाणी घाला. ४. एका पातेल्यात तूप गरम करा. त्यात ठेचलेली लसूण घालून लालसर होईपर्यंत परता. ६. काळं मीठ, मिर पूड, आमचूर घाला आणि हवं असेल तेव्हढे पाणी घालून १० मिनिटं उकळा. ७. भाजलेल्या शेंगदाण्याचे कूट घालून मिक्स करा. एक उकळी आणा. ८. स्वादिष्ट आणि पौष्टिक सूप गरमागरम सर्व्ह करा.